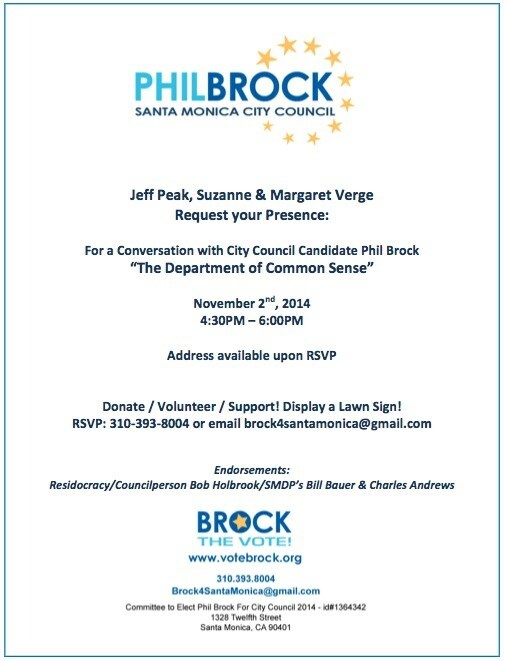 The Phil Brock for City Council campaign has numerous events scheduled this week throughout Santa Monica. Take a look at the calendar list of events to find where Council Candidate Phil Brock will be next. We invite you to just "stop by", engage Phil in a discussion about our town and find how why you should "Brock The Vote" on November 4th. By the way, our lawn signs need a home...yours! They're available at every event or just email our headquarters at Brock4SantaMonica@gmail.com and we'll install one on your lawn. We must install accountability in City Hall, stop tax increases, control the pace of development and respect our residents.